Sweet and cuddly, shy-guy Elmer knows how to rock a pair of purple boots! He's looking for an adopter who will give as much love as they will receive. Elmer is one of the sweetest dogs you will ever meet. He loves to cuddle, burying his head into you to get as close as he can. His quiet charm mixed with his beautiful red and white coat will make you fall in love with him immediately. When he's not busy loving on people, Elmer likes to chase toys and learn tricks. He already knows "sit" and is great at leash walking. He went on a trail walk recently and was the ultimate leisure stroller...happily trotting along with a loose leash. He wasn't a fan of crossing streets and being near moving cars but once he was on the trail, he thoroughly enjoyed himself. He was unfazed by other dogs on the trail, and even stopped to take a nap in the grass with dogs, strollers and runners passing by. He can be nervous in new situations and with strangers, but he desperately wants to be loved by all. He'll approach shyly, boring into you with his deep, soulful eyes, and will melt into you when you return his kindness. Elmer needs an adopter to show him that they love him as much as he loves them. 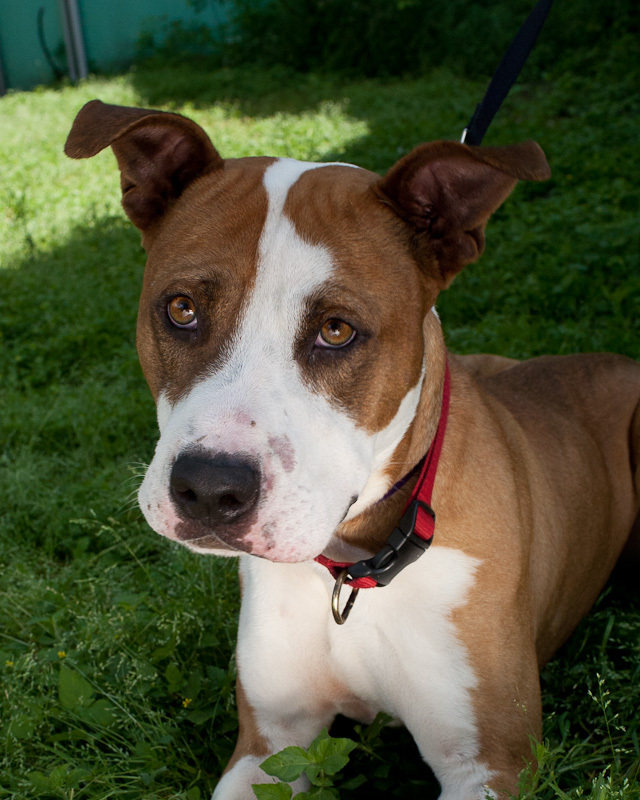 If you're looking for a big sweetheart who will adore you forever, meet Elmer! Conrad is a wise old gentleman who purrs on contact. 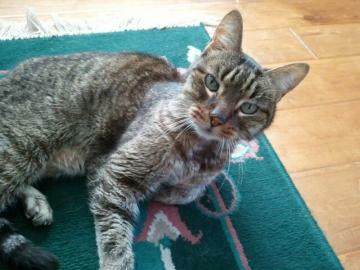 At 15 years old, this docile, sweet cat is so mellow and loving he will fit in to any household. Conrad is a wonderful older gentleman who needs an angel to provide him with a safe haven in his golden years. We don't know what kind of life he has had but we do know that he was very thin and frail when first coming to APA!. He is a little shaky on his legs at times, and prefers to sleep for most of the day. He has been eating well, fattening up a bit, and has responded with lots of affection and adoration for his caregivers. Conrad is not very active but he would love to sit quietly next to you, so that he can be stroked and rubbed. He is patient with kittens, does well with adult cats, and very tolerant of kids (even ones that grab his tail). Surely there is someone out there who can provide this sweet guy with a safe home, a quiet spot in the sun for him to sleep in, and some much deserved love for the rest of his days. All APA! foster kittens/cats are litter box-trained, tested for FeLV/FIV, spayed/neutered, vaccinated, treated for worms/fleas, microchipped and come with a 30-day health insurance plan. As part of our monthly “Breeds Page”, Wagatha’s will sponsor a highlighted Rescue group or dog club affiliated with the breed being featured. To lend support to the tremendous service these organizations provide, Wagatha’s will donate 5% of web sales to the group for the time they are highlighted on our site. For our “Breeds Page” this month we are proud to highlight not only a specific breed rescue group, but an over all outstanding Pet Rescue, including cats and dogs. Austin Pets Alive! is the largest dog and cat rescue in Central Texas and our mission is to promote and provide the resources, education and programs needed to eliminate the killing of companion animals. Our main facility is located in downtown Austin at 1156 W. Cesar Chavez and since our work began in 2008, we have rescued over 13,000 animals from the euthanasia lists at other shelters. They are implementing innovative and progressive programs in Austin and Central Texas after studying the best practices of other cities who are no-kill or are in the process of becoming no-kill. APA have created their own “road map” that uses a lot of experience from many different places as well as incorporating the unique characteristics of the Austin area. Austin is rich in prevention resources such as spay/neuter, compared to other cities, and we are filling the gaps in service areas that have been historically under-represented, such as high volume, high quality adoption. APA iscurrently focused on helping the healthy and treatable pets who are at risk of being killed in a shelter, by rescuing the pets who are at the greatest risk and helping owners who are having problems so great that they need to surrender their pet(s) to a shelter.